After reviewing my statistics (for my blog) I am pleasantly surprised with the amount of traffic I have received over the years. 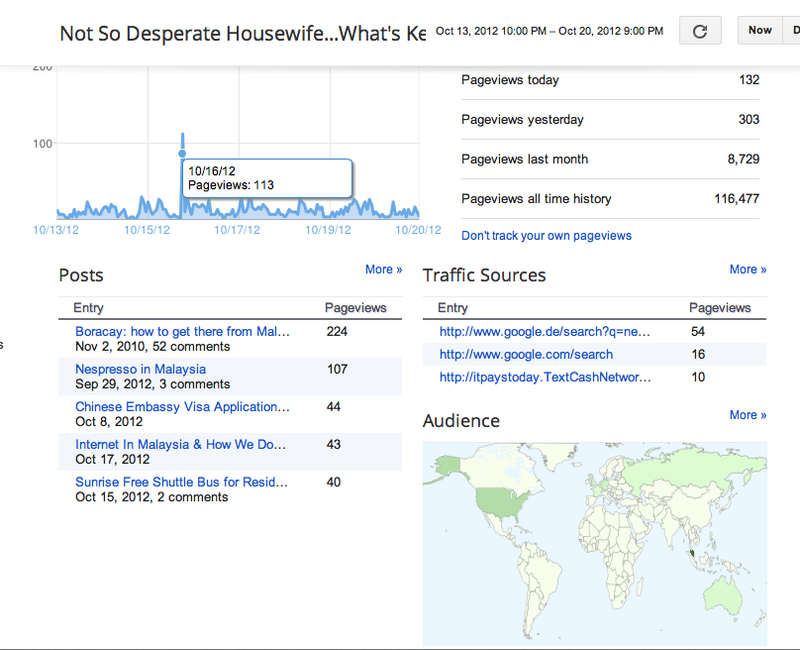 When I started this way back, I did not imagine having 100,000+ page views. All I had in mind was to post something useful so that other expatriates who may be looking for information can at least find it here ... as I document my life here in Malaysia. Glad that I was able to help some people from different walks of life. And honestly, I made some new friends over the years! There were some people who contacted me (thanking, asking for more info) and there were others who wanted to meet up. A chosen few became good friends and our families did some get-togethers which were memorable. Some of those friends have left already -- being expats-- after 2-3 years had to go back to their home country. I am amazed at what this blog brought me -- new friends and helping people who are searching for certain information. Just wanted to share the stats I saw today on my blogger profile... Thanks again and do keep on reading! Can't see the picture? Is it working? thanks for telling me! updated it again... appreciate that you commented and brought to my attention... merci!! !